I’m Jemma, a freelance copywriter, co-owner of Portugalist.com and honorary Lisboeta. I left my Edinburgh-based office job in 2012 with the goal to live in as many cities as possible. Maybe it’s the 300 days of sun each year, or the fact that it’s surprisingly cheap, but Lisbon keeps pulling me back. Since 2013, I’ve called the city home. Here’s how to enjoy Western Europe’s cheapest capital city, for less. 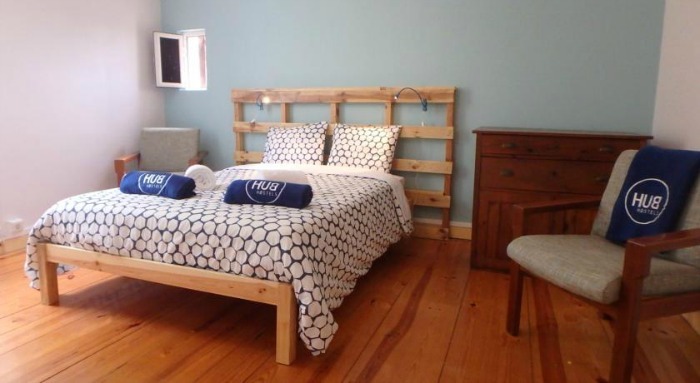 Lisbon is one of the best cities in Western Europe for cheap accommodation. Prices rise in the high season – June to September, and Carnival (February – March). Local events like the Feast of St Anthony, which takes place in mid-June, and international ones like Web Summit (November) also see prices rise. Lisboa Camping – €5.95-7.90 ($7-9)/adult/night, €6.30-9.60 ($7.50-11.50) for a standard tent/night. This campsite is 5km from downtown and there’s a bus stop right outside, so it’s easy to get into the centre. 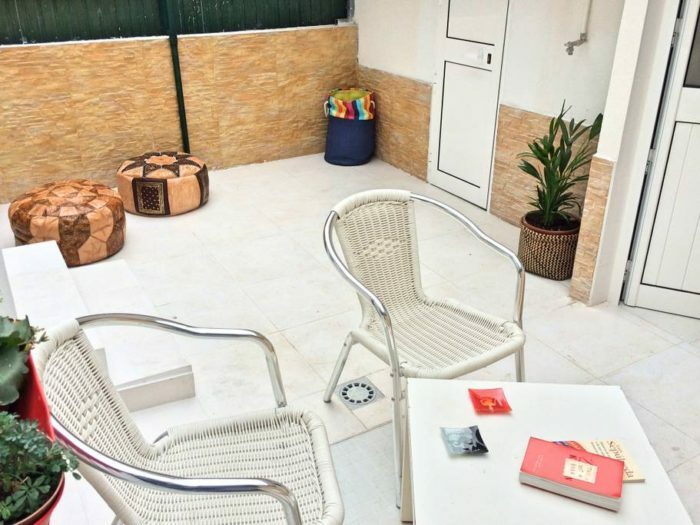 Tip: My favourite neighbourhood to look for accommodation is Alcantara, which is right underneath the Ponte 25 Abril – aka Portugal’s answer to the Golden Gate Bridge. This neighbourhood has started to gentrify, but is still very much a local neighbourhood. If you really want to save money you can walk into downtown Lisbon from here (it takes around an hour) or catch the tram. You can eat like a king in Lisbon on less than $10, although fair warning– vegetarians might find it a bit difficult, as the Portuguese diet is heavy on meat and fish. 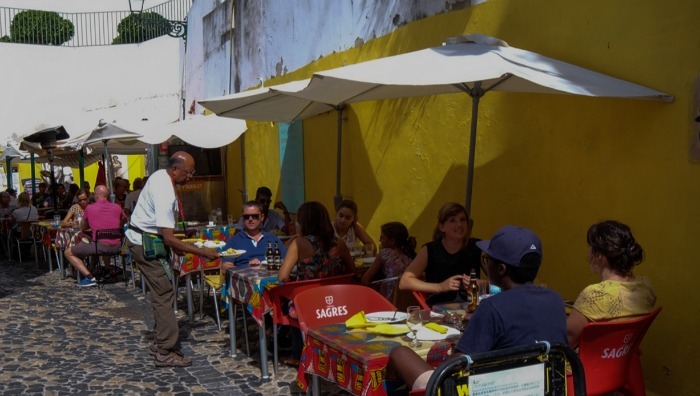 There are plenty of cheap places to eat in Lisbon – just avoid anywhere with a waiter standing outside, with a menu that’s translated into every language. I recommend looking for traditional pastelarias, with paper tablecloths and old men sitting outside sipping espressos. This local joint in Alcantara is one of the cheapest places to enjoy lunch. For less than ten bucks you get soup, a plate of grilled meat or fish, half a bottle of wine/beer/soft drink, bread and olives, a dessert and an espresso. Not bad! The bifana is my go-to when I need lunch on the go. It’s a thin pork steak served on a crusty roll, with an obligatory squeeze of yellow mustard. You can get it everywhere in the city, but O Trevo is where Anthony Bourdain eats – and uncle Tony is rarely wrong! This unfussy local joint just off Avenida Liberdade serves Portuguese fare, mainly to office workers. Arrive early to avoid the queue, and try the national dish bacalhau (salt cod). 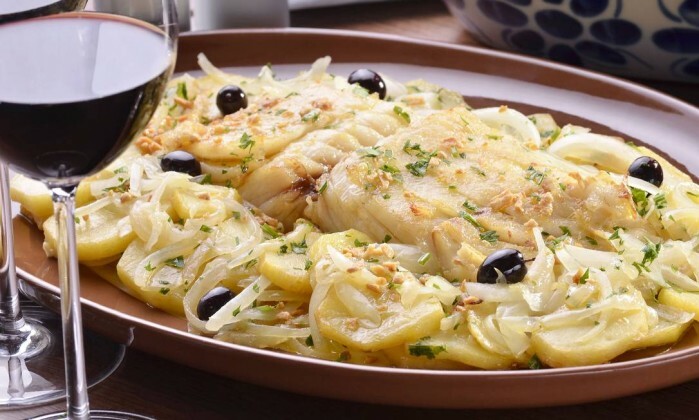 There are more than 365 ways to cook salt cod in Portugal, and this restaurant specialises in ‘a braz’ style: flaky cod mixed with sweet onions and soft potatoes, bound together by creamy scrambled egg and garnished with black olives. This no-frills restaurant beside Rossio station is great for a beer and a snack. My boyfriend swears by their bifanas, but in my opinion it’s the best place in Lisbon to sample salgados: deep-fried treats which are best served with a small beer. They sell a wide range but the my favourites are rissois camarao (minced prawn in breadcrumbs), chamucas (samosas) and pasteis de bacalhau (cod cakes). Frango assado (grilled chicken) is ubiquitous in the south of Portugal, but the best I’ve ever had is from this little restaurant in Mouraria. The chicken is charcoal grilled in a coconutty sauce, and is served with coconut rice and chips. The spicy version, a Cafreal, is worth trying too. LowCost.come sells typical Portuguese fare for super-low prices. The dish of the day changes, but there are some constants – including Porto’s famous sandwich, the Francesinha, a monster packed with sliced sausage, ham and steak and topped with melted cheese, a fried egg, and a tomato and beer sauce. When it comes to cheap (or even free) things to do, Lisbon has an embarrassment of riches. Entry to museums and monuments is often free before 2pm on Sundays (you can find a list of participating ones here). 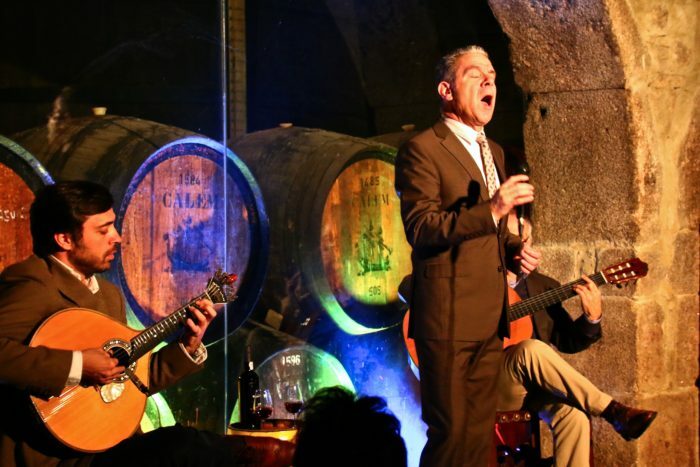 You can’t visit Lisbon without hearing Portugal’s mournful soul music. Skip the pricy places offering ‘dinner and a show’ and hit a tasca (bar) instead. Just wander around the Alfama neighbourhood, and look for bars with music pouring out of them. For the price of a glass (or two) or Portuguese wine you can happily enjoy the show. This modern museum in Belem is free to enter and has works by the likes of Picasso, Warhol and Dali. The LX Factory used to be a manufacturing complex on the banks of the Tagus River. Now it’s home to cafes, bars, co-working spaces, and on Sundays it has a flea market. It’s free to just wander around and enjoy the vibe. Pop into the book shop, Ler Devagar, which is (in my opinion) much more magical than Livraria Lello in Porto. It’s also free to visit Rio Maravilha for the iconic view from their roof terrace. THE place to drink in Lisbon, the bairro alto (high neighbourhood) perches above Cais do Sodre. The higher up the hill you climb, the cheaper the drinks get. You can find pints of caipirinha for €3, served in a plastic cup so you can drink on the street and mingle. There are some super quirky bars up there, including one that only serves mezcal and one that shows B-movies. The famous rickety yellow tram 28 trundles towards the castle, and you can ride it for the cost of a standard public transport ticket. Ferries across the river are also considered public transport, so it’s a better option than an expensive river cruise. Pick up a Viva Viagem metro card (€0.50) as soon as you arrive (it’s good on all public transport), and just zap it whenever you get on a tram or ferry. You’ll save about €0.15 on every journey. Thanks so much for sharing your insights, Jemma! If you guys have any other city tips to share, I’d love to hear them in the comments! I really appreciate your cheap city guides! 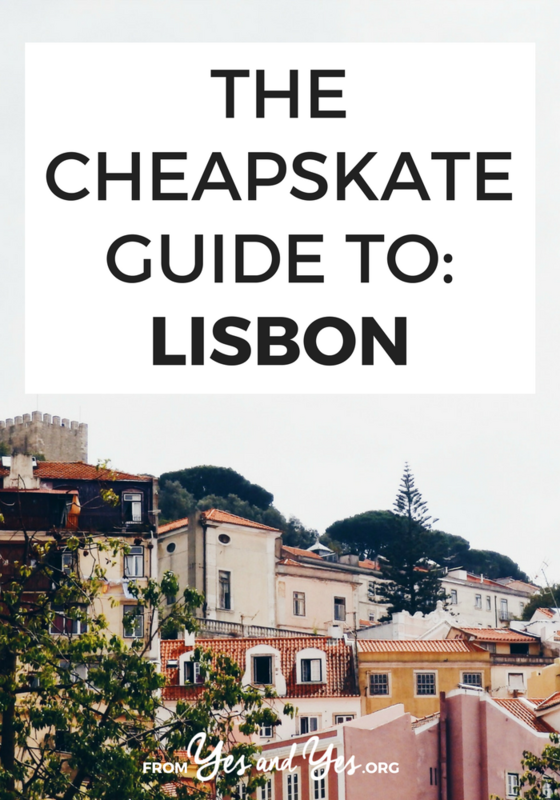 Lisbon would be awesome on a budget!